"The scope of our study is two-fold. First, we wanted to highlight the factors which lead to either political cooperation or tensions in transboundary river basins. And second, we wanted to map and monitor the likelihood of these kinds of interactions over space and time and under changing socio-economic conditions," explains JRC researcher and lead author of the study, Fabio Farinosi. The Nile, Ganges-Brahmaputra, Indus, Tigris-Euphrates and Colorado rivers are "water hotspots," where "hydro-political interactions"are most likely to occur. 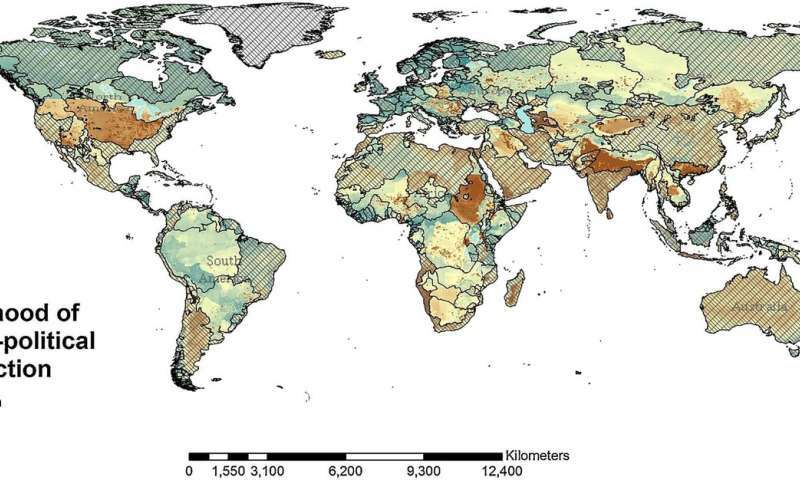 Globally, the combined effect of climate change and population growth can increase the likelihood of water-related interactions in transboundary river basins by between 74.9 percent and 95 percent. "This does not mean that each case will result in a conflict. It depends on how well prepared and equipped the countries are to cooperate. This is where we hope our research can help, by raising awareness of the risks so that solutions can be sought early on," Farinosi says. The index and model complement the SDG indicator "6.5.2 Proportion of transboundary basin area with an operational arrangement for water cooperation," by providing additional intelligence on important contributing factors that are not yet included in the current SDG monitoring framework. Well, as the Old West saying goes; "Whiskey is for drinking with your neighbor. Water is for killing your neighbor over!"